Red Molly On Mountain Stage The acoustic roots trio's buoyant three-part harmonies delight in this Mountain Stage performance. 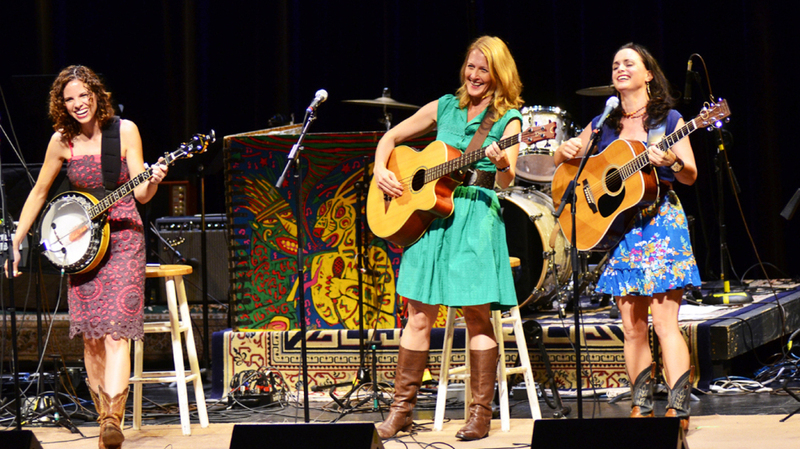 Even though the band was making its first appearance on Mountain Stage, the acoustic roots trio Red Molly earned a standing ovation from the sold-out audience at the Paramount Theater in Bristol, Tenn./Va. Formed around a campsite at the 2004 Falcon Ridge Folk Festival, Red Molly spent the next six years becoming a crowd favorite at events like the Bristol Rhythm and Roots Reunion and MerleFest. Red Molly, whose sound is marked by buoyant three-part harmonies, is made up of founding members Laurie MacAllister and Abbie Gardner, as well as one newcomer: Austin-based singer-songwriter Molly Venter. The band's 2008 album Love and Other Tragedies had a long run on the folk and Americana charts, and its follow-up (James) fared even better. The trio's latest release, Light in the Sky, is its first with Venter in the fold. Red Molly is followed by Mountain Stage band pianist Bob Thompson, who performs "Come All You Fair and Tender Ladies." This show originally aired on October 25, 2011.